Distinctive features: Shrub; This is the only Dogwood with alternate leaves.  Flowering Dogwood (Cornus florida) - Has opposite leaves and branches.  Red Osier Dogwood (Cornus stolonifera) - Has opposite leaves and branches; usually grows in damper soil.  Round-leaved Dogwood (Cornus rugosa) - Has opposite leaves and branches; leaves are obviously round. Leaves have more than 6 veins.  Dogwoods - All other dogwoods have opposite leaves and branches. 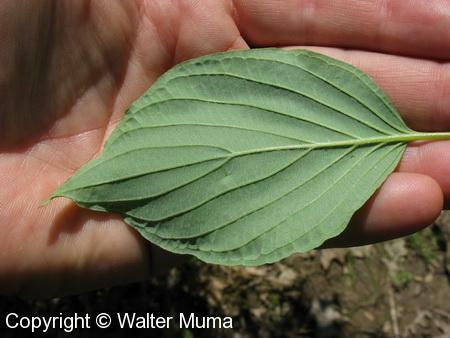 Leaves: Alternate, Simple, Entire; Leaves have 6 veins. Photographs: 192 photographs available, of which 18 are featured on this page. SCROLL DOWN FOR PHOTOGRAPHS. Showy clumps of white flowers! 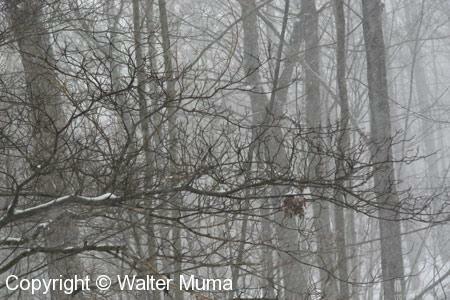 This winter photo of Alternate-leaved Dogwood whows the branch structure. 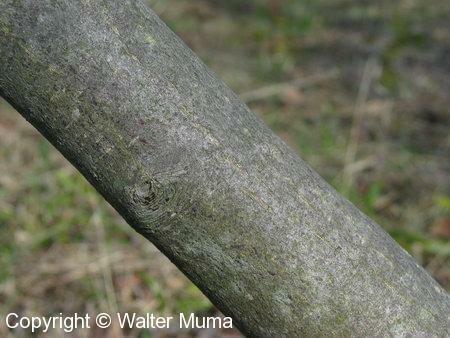 The trunk varies, as shown in these photos. Sometimes the branches closely resemble those of Red Osier Dogwood (Cornus stolonifera) and even Silky Dogwood (Cornus obliqua). When branches die they aquire this yellowish cast. Bud in spring (late April). Fall colours of Alternate-leaved Dogwood. 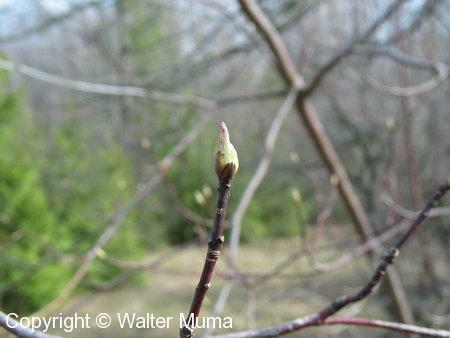 Here is a non-typical Alternate-leaved Dogwood (Cornus alternifolia) growing in the Guelph Arboretum.